Hi there!!! Welcome to Michelle's (Scrappin with my Bug) SURPRISE Birthday Blog Hop!!! Happy Happy Birthday Michelle!!!! I hope you have an incredible day and get lots and lots of crafty goodies!! If you arrived from my amazing friend Gaby you are in the right spot! If you just happened to hop on over and would love to see all the amazing projects start at Candace's blog for the beginning! I was determined to make a different shaped card for Michelle and started to make a scrumptious Strawberry Ice Cream Cone. So...... I had to try again! I changed my method and went for a cupcake instead! Your next stop is my Creative friend Crystal!! Jaded Blossom is giving away a Sweet Celebrations and Gumball stamp set to two lucky people who comment on all the blogs by Monday 8 am. A Third prize (TBD) will be given away on the Jaded Blossom blog. To be eligible to win that prize you must wish Michelle a Happy Birthday. Both cards are so cute. I absolutely love the cupcake card!! I'm sorry the first project didn't work out so well. It started out great! I love your cupcake card though. The background paper is the bomb! TFS! I liked both of your cards. Both your cards are super cute Kim! Love the colors! Yummy, both cards look great. Love them. I love both of your cards. That is the beauty of crafting, those little mistakes make them unique. I love them both!!! But, the cupcake one is SUPER CUTE!!!!!! I specially LOVE the shape!!! Both projects are great!!! so sorry your embossing powder did not cooperate because the chocolate looks yum!!! Woo neat projects! Love them both~the colors and embossing! Great cards! Sorry the embossing didn't work well for you on the first one. Both of your cards turned out adorable!! love the papers you used! Sorry your embossing didnt turn out :( but you still created adorable cards! Wow! I love both your cards! That strawberry one is yummy! And love the patterns and colors you chose for the second one! Fabulous job! Both cards are great! LOVE the colors! Thanks for the ideas! Very very cute card!!! Love the colors. I think the first one is still cute, but LOVE the second one! 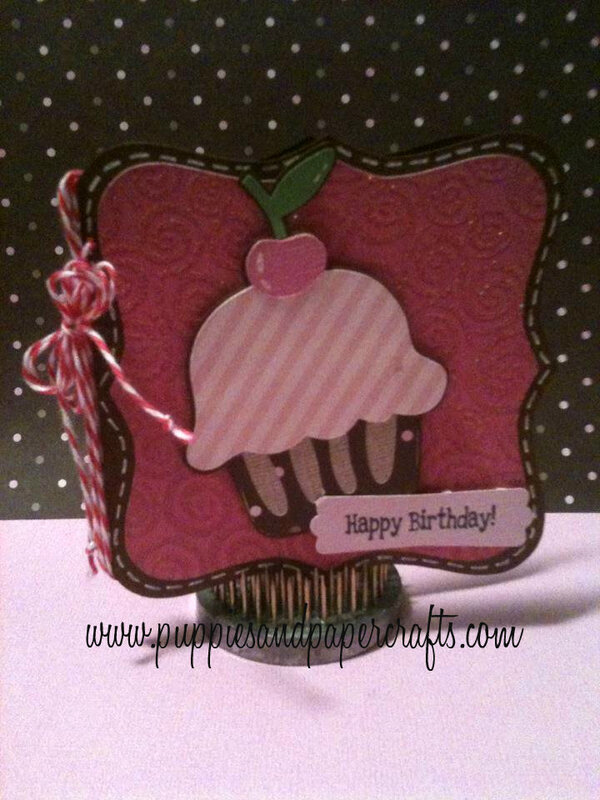 Great projects.. Love the cupcake card super duper cute!! Adorable cards- love the color combination on them. I really like both of your cards. Great job! They both look yummy! This sweet birthday hop is giving me some serious cravings! Happy Birthday to Michelle!! Love the ice cream cutout! It looks yummy! The cupcake cutout is adorable too! I like both cards! You can barely see the embossing error on the first one. Love the ice cream cone and the cupcake... It's frustrating when powders/glitter don't work out. Love both of your cards! They are so cute and look so yummy! HeHe. 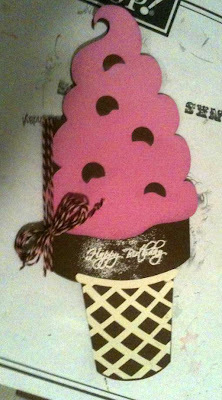 I'm sorry about the dry embossing being difficult on the ice cream card.. I have trouble with it too sometimes so I know how frustrating it can be! It's just the nature of crafting. Lol. But your cards look beautiful regardless! Awww, the ice cream cone is beautiful. Definitely try again. You did a fantastic job. She's sure to love it! YUMMY! Looks good enough to eat. Great job. Love both your cards! Thanks for sharing yor boo-boo card. We all have things that we start and never quite make it to share. Cute cards! I have trouble sometimes with my embossing powder too. They are both Great cards! I love that you posted the cone even with it's imperfection. LOVE IT!! Kim both cards are awesome! That's what happens with real ice cream! Yum! Cute cards and love the shaped ice cream.